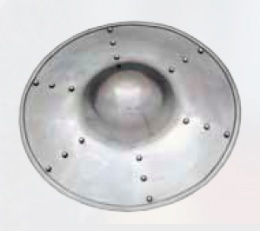 A well formed and dished buckler shield most suitable for fencing. It is fourteen inches across the back, weighs about four pounds. The central boss houses the center grip on the reverse. This shield of is 14 gauge mild steel with rolled edges for extra strength and rigidity. Polished outside, black paint inside. Shields similar to this were in use throughout Europe from the late 13th thru the end of the 15th centuries. Many examples of this typical medieval shield exist in museums and private collections. This page was last modified on 8 November 2013, at 08:22.